Sometimes, I fail. Like tonight, when I made up this fun late night snack. Jeremy was hungry, so I wandered into our kitchen and found some inspriration in a homemade fruit and cheese plate (with a bonus veggie). I happily sliced up apples and carrots and strawberries. 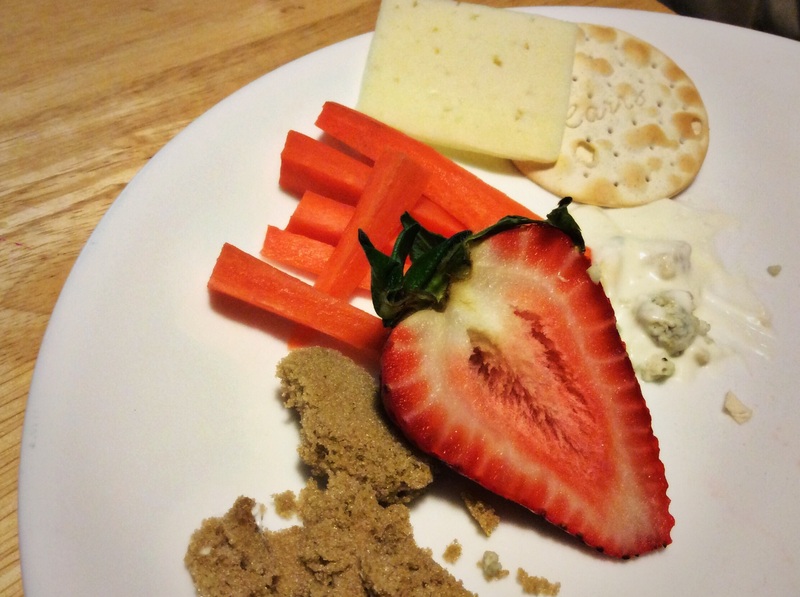 I found some delicious Havarti and added fresh blue cheese to the carrot dip. And as I sat eating my fun snack with my husband, all of a sudden it hit me: the heavy realization of trying to swear off eating excessive sugar, something I vowed only just a few days ago. I’d actually been doing really well. The other day, I passed on buying the caramels that I love and resisted eating the Heath bar that was stashed in our car. I’d even kind of told myself that I didn’t even miss eating sugar and candy. And then, tonight, just after dipping my last strawberry in a cool mound of sour cream, as I went to gently coat it with a dusting of brown sugar (it sounds weird, but is really tasty), I suddenly remember my less sugar vow and realized in that moment that I failed. Obviously, failing at a sugar vow is not the end of the world. But I certainly have other areas of my life that leave a much bigger impact, when I fail. Like when I fail at parenting, and maintaining self control. I totally want to be one of those calm, whispering moms. The ones that silently control their children with a soft word or two. But nope. Most days, I’m that clenched jaw into yelling angry mom and when it’s all said and done, I’m left feeling like a complete failure. There are other areas that I fail at too. I try to do everything, and then completely feel overwhelmed. I let my worries consume my thoughts and waste my time being anxious. And then there is the laundry. I always fail at the laundry. But it’s in moments like this, that I’m reminded that it’s okay to fail sometimes. Because it’s kind of just part of life. And I know that even though I fail, God doesn’t and He will always be there for me. Psalm 73:26 says, “My heart and flesh may fail, but God is the strength of my heart and my portion forever. It’s such an encouragement to know that God never fails and that he will strengthen my heart and be everything that I need, forever. Laura, you’re in great company. According to the bar you set, i am the biggest loser and we moms are all failures. We are only human, and our kids love us despite our fails. Its how we deal with the fails that count. Do we pick ourselves up and try again? Do we apologize and try better the next time? Do we blame it on a bad hair day, no half and half left for our coffee and our husbands forgetting to run the errand we reminded them twenty times to do (hands up here). You’re awesome, and thats all your kids see, awesome mommy.